Kazha is a rock band formed by a Japanese singer/songwriter Kazuha Oda and a guitarlist Hideki Matsushige. Kazuha Oda has worked over 20 different records/projects from classic to heavy metal music in Japan. She has worked with wide variety of performers including Grammy winning pianist Bob James. 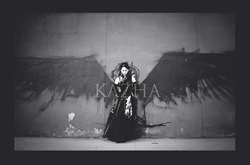 In September 2009, Kazha released their first EP "Breath Through Your Dreams" and toured Japan and Korea. After releasing their first album "Overture" in 2010, they shifted their base from Japan to U.S.A. in order to further their goal of sharing their music with people all over the world. They debut in the U.S.A., performing at Asian Heritage Street Celebration, sharing stage with Far East Movement. Since then, they have been performing with numerous national acts including Trapt, LA Guns, Y&T, Tantric and more. They released their 2nd album "Evolution," and continue their musical adventure armed with their strong belief in their music and aspirations of achieving their goal. Their music combines the softness of a falling feather and the heaviness of a hurricane.